Google My Business is a local search listing for your company that improves your search engine marketing. 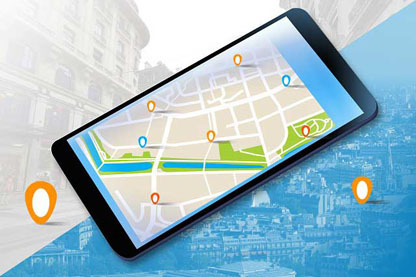 It allows you to manage your online presence and includes features like Google Maps. With one profile, you can manage up to 10 locations. If you have more than 10 locations, then you can use Google My Business Locations dashboard. It's like having a Yellow Pages ad, but better, because it's tied into the Google search engine. Best of all, there is no charge for your listing in Google My Business. Who could say no to what amounts to free advertising? Simply complete a business profile. Provide information about your company name, location, phone, hours, and description. Your listing will appear across all Google platforms, like search engine results, Local Pack, Maps, and Google reviews. In addition to the information above, you can enhance your listing by adding photos and customer reviews to your listing. You can configure your profile so that Google My Business allows you to receive alerts when a new review appears on your listing. You can also add photos to enhance your listing. Once your profile is set up, you can manage your business with data you can access on the following: how often people click on your website, click-to-call, request directions, and how many see your results in their Google searches. Because you can control all of your information from this one dashboard, you no longer need to update your Google+ and Google Maps for Business pages. Anything you change in Google My Business will automatically update all of your other Google platforms. If you have been using Google Places for Business or Google+ Pages dashboard to manage your business information, Google has automatically upgrade you to Google My Business. Make sure all of your business details are consistent with all of your other online listings. Google will pull your name, address, and phone (also known as NAP) from a variety of different sources. Consistent information across other platforms like Yelp or Squarespace increases your online visibility on local search engines. If you do not have a brick and mortar store, there is a separate page where you can list your location but also check off that you deliver goods and services to your customers at their location. Filling out your location is important to Google because it legitimizes your business. Although you want to be consistent with your NAP, create a unique description. Google doesn't want to see a description that you just pulled from the About section of your website. Choose an accurate business category to attract the right type of search traffic. Not sure what category to choose? Google some of your competitors and see what is working for them in terms of getting found by the search engine. Make sure you have no duplicate listings, maybe with old addresses or a different version of your company's name. Either merge these with your up-to-date listing or delete them, as this could negatively impact your local search rankings. To remove, first delete the Google+ page of the old listing, then send a message to Google My Business support asking for a transfer of the Google Maps old listing into the new listing, along with a transfer of any customer reviews from the old listing. Most importantly, Google My Business will help your search engine marketing efforts to rank higher in the search engines. This helps you get in front of more local customers. Not only will you come up on search results, but location results as well. You can increase your rank in local searches, and if optimized correctly, can come in ahead of organic search results - again, without the cost of paid search. First, search here to see if your company already has a listing. If you find a listing for your company, you can claim your company. You will need to verify that the company is yours before you receive full access to your account. Google commonly does this by sending a postcard to the address that is in the listing. It can take 1-2 weeks for the postcard to arrive. Sounds old school, but Google wants to make sure you are located where you say you are. In the meantime, do not make changes to your listing, as that could delay the verification. You can also verify via phone. If you have more than 10 locations, Google provides a way to verify them in bulk. What do I do if someone already claimed my business? First, try signing into Google using another account. You may be connected to the listing via another account that you have but don't regularly use. However, if this is not the case, you will need to request admin rights. You can do this by contacting the page owner and asking them to add you or transfer rights to you. The other way is to request rights through Google My Business. How do I optimize my business listing? If you do nothing else, make sure, as we've mentioned earlier, that all of your information is consistent. Your business will look more credible when all of your information matches across your listings. Add content. This could be in the form of photos, videos, or descriptions. Google loves content, but remember that it loves quality content. Photos are great because people respond to visuals. Photos and videos of your organization can lead to consumer confidence that you are a bona fide and trustworthy business. You can upload a virtual tour to show off your business or include photos of your most popular products. Avoid using clip art. Real photos only. And name your photos with your most important keywords. Use keywords that your customers would be using to find your product or service. This could even include words relating to your location. You could even set some negative keywords, so people are not accidentally coming to your page when they are looking for something unrelated to what you offer. When a customer reviews your business, you can receive an alert so that you can respond in a timely manner. Never underestimate the importance of these customer reviews. This is something that the customer in a research phase is reading and likely judging your business on. Solicit positive reviews from current, happy, satisfied customers. Remember to thank them for their review or recall something you remember about what a pleasure it was to do business with them. Be sincere. If you receive a negative review, be sure and respond to it rather than leave others wondering if they should expect the same experience. Be respectful, which may mean responding with emotions in check. Regardless of whether or not your company is truly at fault for the negative experience, say you're sorry their experience did not meet their expectations. You can then explain what they should expect when they do business with you. To address their concerns more specifically and personally, ask the reviewer to contact your privately so you can discuss. Think about it - when are you most likely to write a review? Odds are that it's when you have a negative experience. That's why you need to be proactive. When you come across that customer who you believe can give you a positive review, just go ahead and ask them for one. "Would you take a few minutes to review me on Google?" Most of the time, they just need a personal invitation to do so. And they already like you, so they're also likely to want to help you out. But don't pay people to give you glowing reviews. That would be in violation of Google's terms of service. What is the Google Three Pack and how can I be a part of it? The Google Three Pack are the top three organic searches found in a local search. The Three Pack replaced the previous Google Seven Pack. Obviously, this means higher exposure for less companies. Instead of the links going to your Google+ page, the links are now going directly back to your website. Viewers have the option of choosing More Places, and can filter by rank. When viewers click on any of the businesses, they will be brought to your Google My Business page, which is essentially your online business card. Your company listing is claimed and verified. Your Google My Business page is completely filled out. You have customer reviews and you are responding to them. Again, solicit reviews from customers who have had positive experiences with you. This is something you can include on either your business cards or invoices. Google places higher value on your company when it sees real reviews, especially from local customers. Have some local links as well as back links to your website. Build a consistent presence on online business directories like Manta, YP.com, Whitepages, and Google. Build a strong presence on social media. Google Posts allow you to add more to your listing than simply hours of operation and location. Now you can add location-specific promotions. On a mobile device, this will appear at the top of your search engine results page, and you can use this to grab the attention of viewers looking for the latest deals. Question & Answer allows you to answer anticipated customer questions. These might include whether or not you accept credit cards, or where to park when someone visits your store. As of this writing, however, this feature is available only on Android devices. Still some kinks to work out here - Right now when a visitor asks a question, he or she does not receive any notification that a response has been given. And in order for you to receive notification that a question has been asked, you must have the Google Maps app and be signed in with the same Google account that you use to manage your Google My Business listing. Google says "upvoting makes popular questions more visible". What this means is that if someone goes and "likes" the question, instead of "See questions" appearing on the page, viewers will actually see at least the first question and entire or partial answer, saving the viewer a click that they might otherwise ignore. This feature is still in the piloting stage, but Google is developing Chat capabilities so you can communicate with your customer in real time. This feature has great potential to help you connect with your customers and help close a sale by answering any questions or concerns a customer might have. Remember that no ranking stays consistent. There is no website that stay ranking #1 or #2 long term, maybe not even in the top 10. Google is constantly changing its ranking specifications. For example, Possum Update caused some rankings to drop, while others rose in the rankings. Both proximity and your city limits and location factored into this. The rankings are looking more locally for companies, that is, paying attention to the zip code rather than just the city in general, that provide the product or service that the viewer is looking for. Staying tuned into Google's latest and greatest can be time consuming, but is entirely necessary so you know what you need to do to adapt your website(s) to rank high in the search engines to get customers to your place of business. Lastly, if you see that value but are short on resources to set-up and you'd like to claim your free listing and get set-up for free give us a call. We provide this no-charge service to businesses and their owners that operate or live in Carol Stream or surrounding communities.